His coat is weather-resistant and doesn’t attract dirt or dust, so it is comparatively easy to take care of him. 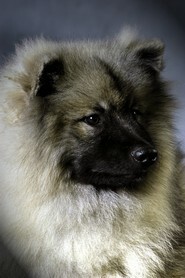 Unlike many other breeds he doesn’t need to be trimmed or clipped or to be bathed ot combed constantly. A brush will suffice. A weekly, thorough brushing is sufficient. In the last ten years the selective breeding has produced a thicker coat. Whether this is an advantage or a disadvantage remains to be seen but it has produced a proud show dog. Wolfspitz owners have to spend a little more time caring for him. Naturally, how much time is needed depends on the individual dog and his behaviour (e.g. if he likes splashing his way through every puddle he finds) and also whether the dog is male or female. Ideally he should be brushed every day or at least every two to three days. Brushing him massages him and stimulates blood circulation; the natural oils in the coat are evenly distributed from the roots to the tips of the hairs making the coat look clean and shiny. It is easy to see if the Wolfspitz has been brushed regularly or if his owner has forgotten. ° A metal bristled brush about 3-4 cm long (without plastic at either end), the bristles preferibly set in flexible rubber (india rubber). °A soft, natural bristle brush. °Two metal combs, one with wide-spaced teeth and the other narrow, about 3-4 cm long, or a comb that has both. 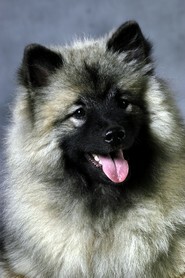 °A spray bottle for water and/or conditioner for his coat. A metal-toothed brush is the one you will use more often. 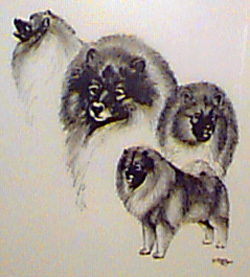 With both males and females, who have a less dense coat, a natural bristle brush can be used for daily care. 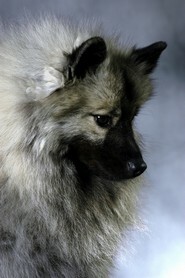 Spray a little water and/or conditioner for dogs onto his coat before and during brushing him. I begin with the dog lying on his side and start by brushing his elbows, proceeding bit by bit to the withers, always brushing in the direction the hair grows. You can also begin at the neck and proceed to the tail. It is the same but it is important to remember to brush every part of the dog from the skin to the tips of the hairs and not superficially. His trousers should be brushed in the direction of top to bottom. His ruff is more easily brushed if he is sitting. Use the natural bristle brush as the final touch: with the dog standing, brush him from his tail to his neck, brushing against the growth of the hair. Brush his trousers upwards and outwards. We advise concentrating on a particular area of the coat daily, using the metal brush: one day the ruff, the next the tail and so on and always finish with a brief over-all brush with the natural bristle brush. In this way the dog always appears well-cared for and doesn’t have to stand still for too long. The comb is used for those areas where the coat is softer and gets easily knotted e.g. behind the ears, behind the elbows, the stomach and the feathering on the front legs. The comb must be used carefully though to make sure the fine under-coat iis not pulled out. Only during the period when he is changing his coat is the comb used all over the body to eliminate the dead hairs. The Wolfspitz MUST NOT BE CLIPPED under any circumstances otherwise his skin will be exposed to the sun and could be seriously damaged. For a breed that is rarely bathed the best care is a regular, thorough brushing. Bear in mind that a healthy, shiny coat does not depend on frequent baths but rather on a correct diet. 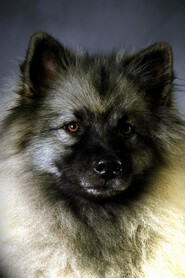 A Wolfspitz needs a diet that is high in protein to keep his coat in good condition. The diet needs to consist of good quality food containing about 30% protein and the correct balance of amino acids. The original diet of this breeds in Holland consisted of fish, milk products, rice, beetroot and chicken. Today a diet with the protein coming from fish or chicken is recommended, a high content of stearic acids, and a low percentage of carbohydrates deriving preferably from rice and beetroot. A well-known American expert maintains that the best diet for the Wolfspitz should contain corn, soy, lamb, fish and horse-meat.